Due to their different ports, the http:// and https:// versions of your content are considered as two different websites by search engines. In order to prevent duplicate content issues that can impede your SEO, here’s some great techniques for ensuring only one version of your content is cached. This dummy screenshot illustrates how Google can crawl, cache and display a mixture and duplications of both secure and non-secure content. In order to prevent these duplications and/or mixtures, there’s are a few different ways for nominating a single consistent format. Supported and recommended by Google, Yahoo and Bing (sort of), the Canonical Link Element allows webmasters toÂ declareÂ the preferred or ‘canonical’ location for their content. So if we refer back to our screenshot example from earlier, applying the Canonical Link Element to our https:// content will ensure that only the http version is used within the search listings. To learn more about the Canonical Link Element, Matt Cutts explains it here back in 2009 when it was introduced. Via the ‘Permalinks’ Settings tab you can choose between http and https if you have the website running under both. Since Magento 1.4 the Canonical Link Element feature is built-in as standard. It was added quite quickly by Magento’s developers to tackle existing duplicate content issues due to products being categorised and accessed via many different URLs. It’s worth noting however that the canonical tag will only appear on categories and products by default. Despite this, checking both boxes will prevent the key canonicalisation issues faced with secure Magento websites. Whilst the Canonical Link Element is the best solution, it isn’t always practical to implement. If your site is bespoke, large or a custom CMS, then implementing a site-wide Canonical tag might be too complicated a task. 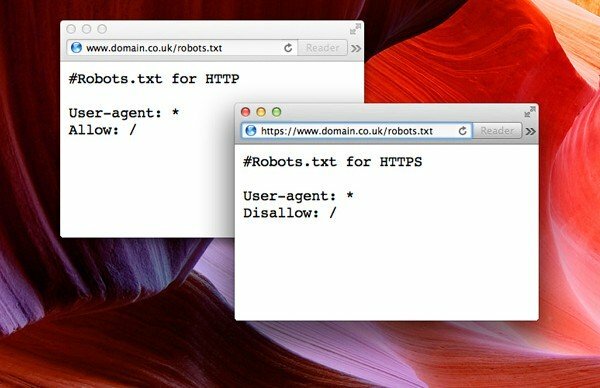 The Meta Robots tag will be deployed on each page of the secure website only. The Meta Robots Tag is set to allow the page(s) to be crawled but not to be indexed/cached. A slide from an old Matt Cutts presentation about the Canonical Link Element. Whilst mild duplicate content issues can arise with site-wide SSL certificates, they can be very easily prevented and overcome by effectively using the Canonical Link Element. Whether using an established framework like Magento or WordPress, or working with a bespoke build, The Canonical Link Element is the most effective and Google Recommended solution. However, the other two options above can be equally effective although they make take longer to take effect if you’re fixing duplicate content issues rather than preventing them. Would love to hear anyone’s questions, comments or contributions to this post in the comments below.